Forget what you see in the movies – most New York City apartments are dime-sized. We can cook full meals on kitchen counters the size of cutting boards and every inch of space is either used or is a pathway. When New Yorkers visit furniture stores, they go armed with tape measures. For fourteen years Frank and I have slept in a full-sized bed only because we did not want to give up the floor space that a queen bed would take up. But every time I actually slept on a queen, I felt so queenly. I was tired of waking up in the middle of the night pushed to edge of the mattress by Toy Fox Terriers. I’d heard that there was such a thing as a “short” queen mattress. They are popular for use in RVs and boats and so they are also referred to as RV mattresses. They are as wide as a queen (60 inches) but the same length as a full or twin (75 inches). We would gain six inches in width without sacrificing five inches of floor space at the foot of the bed. These five inches of floor space were a pathway to maneuver around our small bedroom. If you are not six foot tall, you don’t need those five inches in bed length. I started the search by going to Sleepy’s because they are everywhere in Manhattan and since they call themselves the mattress professionals; I figured they would have many styles to choose from. The two salespeople I spoke with at two different locations had never even heard of a short queen. Not only that, but they showed no interest in finding out anything about it. Next I tried the Internet search. You could find them but they were made of foam or came in a compressed roll that the mattress would pop out of in a Pillsbury dough-like way. These did not seem like something you would want to sleep on every night. My next idea was, what if I went to a department store like Macys with very good customer service. Surely, they would be able order one for me if they didn’t have them in stock already. I got the same reaction – no knowledge and no interest in looking for further information. I was hell-bent both on keeping my five inches of floor space and getting this bed and so on one of our trips to the rural homestead when I drove past an independent furniture store, I thought about small town customer service. 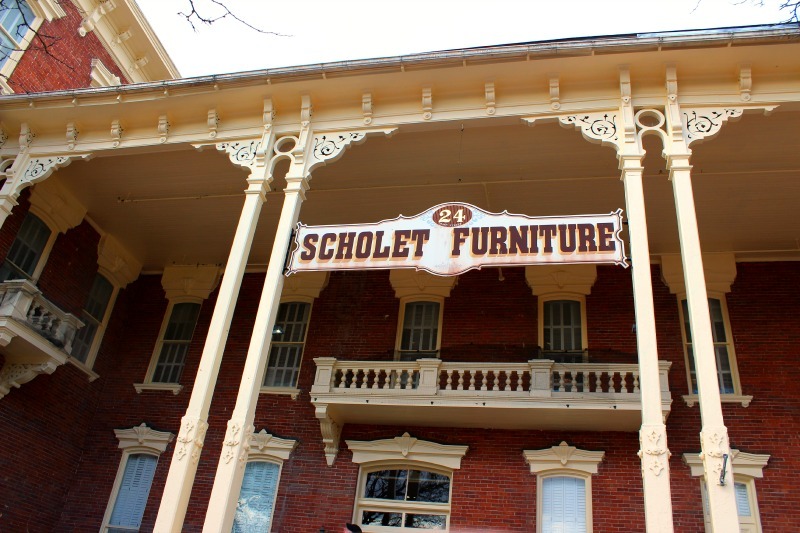 In a wave of optimism, I parked the car and went inside the beautiful Victorian building that used to be the Hotel Augustan, which now houses the Scholet Furniture in Cobleskill New York. When I made my request, the saleswoman not only knew what I was talking about, but she told me that she could order it for me. Then she took me up the grand staircase to the bed section and pointed out the types of beds that could be ordered as a short queen. I could actually test the mattresses and choose which one I wanted to order. Compared to the search, the rest was easy. I ordered the mattress and because they could not deliver it to Manhattan, we had to transport it on the top of the car. Frank lashed it down super securely and drove slowly. The transport had to be timed for a non-rainy non-snowy day, which took some doing in the winter. He hacked the existing full sized bed frame from Ikea by adding plywood sheets the width of a queen. Because the pillow-top mattress was much thicker than our old one, Frank lovingly sawed some inches off the feet of the frame so that the bed was not too high for the little blind dog to leap off. 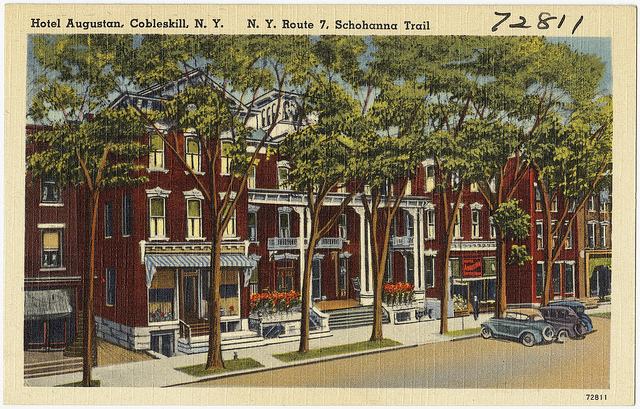 This entry was posted in our revamping and home design and tagged cobleskill new york, furniture for small spaces, furniture for tiny houses, rv mattress, scholet furniture, short queen mattress by ileana. Bookmark the permalink. Ileana, what about sheets now for the short queen. Where do you get fitted sheets for that? And by the way, the memory foam that you rejected is the best thing that ever happened to me! I have replaced every old-fashioned mattress in my place with them. They are SO comfortable. And bed bugs don’t like them–the other perk. Try one some time. You will never go back. I even replaced my sofa bed mattress with one. It is so much more comfortable now! Hi Kristin, I am just bunching and tucking in queen sheets and have not felt a problem. I am sleeping like a queen. The foam mattresses I encountered in my search were not a quality memory foam but stuff that looked like it was for people who would only be using it in a camping situation. So nice to hear from you dear friend. I bet someone makes the perfect sheets for it or you could even fix them yourself so you don’t have to bunch and tuck! Yes, Tempurpedic made the first memory foam mattresses now there are many brands. I bought all of mine on sale at overstock.com who might sell the shorter queen sheets. The memory-foam mattresses do come in a small dense roll that you have to air out for 48 hours before sleeping on them, but they are so nice to sleep on. I’ll never go back to a coil mattress that has to be turned and replaced every 7 years or so. And expensive! You can still do it Katy – but you would have to go upstate to get it. You know, this is such a lovely story. 🙂 I love every step of it from the description of your apartment to the thrill of the chase to the sweet twist at the end of making the bed accessible for your blind pup. Isn’t it satisfying when something works out? Thanks Lauren, your comment made my morning.